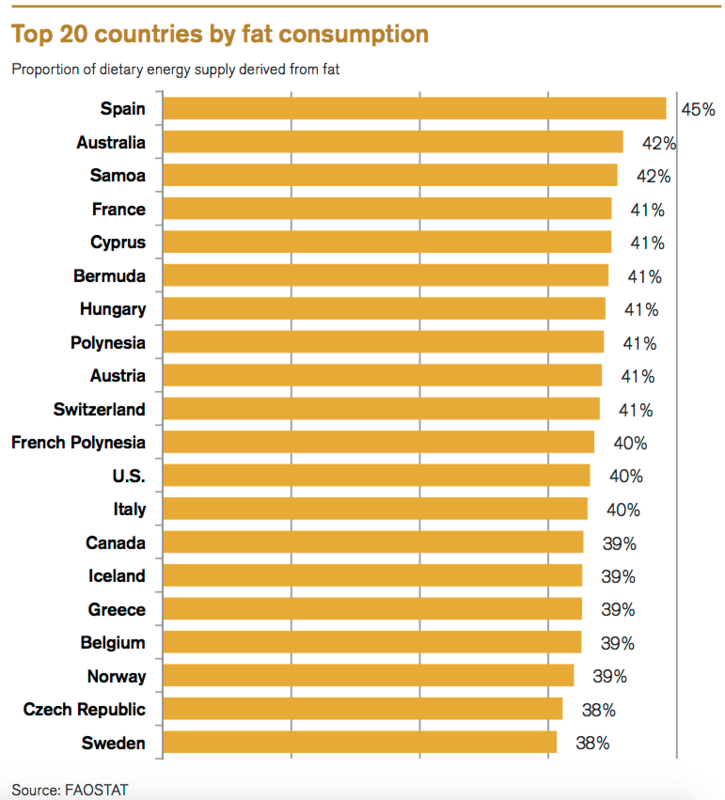 Which countries eat the most fat? America may be the world’s leader in the obesity epidemic, but it’s not the leader in the amount of fat we eat. In terms of overall fat consumption, we’re ranked 12th on a list of the top 20 countries who eat the most fat, according to a recent research note from Credit Suisse on dietary fat consumption and its health and market implications. Several large, recent, peer-reviewed studies have suggested a fascinating but seemingly counterintuitive idea: That the amount of fat you eat may not be as directly linked with how fat you are as we once thought. The data from Credit Suisse may lend a bit of support to those findings. Of course, there are some correlations between the data on obesity prevalence and fat consumption as well: Spain and Australia, for example, both ranked first on this list, each have fairly high obesity prevalence rates. Author: Erin Brodwin is Business Insider’s Science Editor. Image: Freshly cooked fries are seen. REUTERS/Yves Herman.